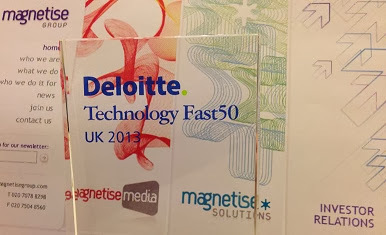 We received some fantastic news this week that we wanted to share with you - Magnetise has been ranked as the 20th fastest growing technology company in the UK in the 2013 Deloitte Technology Fast 50. This significant achievement is due to the fact that performance-based activity and lead generation programmes are rapidly growing in size and stature, as well as our commitment to developing and deploying technology innovations to ensure that our clients can reach, engage with and convert prospective customers through any mainstream channel or format. The news also backs up the lead generation growth and market-size proved by the IAB's excellent Online Performance Marketing study earlier this year. Press Release: Deloitte Ranks the Magnetise Group 20th in the 2013 UK Technology Fast 50 InitiativeThe Magnetise Group (Magnetise), a marketing technology company that improves the reach, return and accountability of digital engagement, has been ranked as the 20th fastest growing technology company in the UK in the 2013 Deloitte Technology Fast 50. Rankings are based on percentage revenue growth over five years and Magnetise grew 1102% across the period. The company has also been ranked 4th in the Internet sector list and 10th in the London region, both significant achievements due to the vast number of other successful technology companies in these subsets. Factors supporting Magnetise’s growth and Technology Fast 50 ranking by Deloitte include increased spend on lead generation campaigns and the deployment of new technology innovations. Performance-based marketing has grown rapidly since Magnetise was founded in 2007 due to the accountability and cost control achievable. Latest figures from the Interactive Advertising Bureau (IAB) show that in 2012 £114 million was spent on lead generation in the UK alone, directly generating £1 billion sales for advertisers. The trade association’s Online Performance Marketing Study also predicts lead generation will command £450million+ annual marketing spend by 2017. This present and future growth certainly tallies with Magnetise’s experiences and expectations. “Our client base is today well-educated about the benefits of performance-based advertising, confident about the value of lead generation and actively seeking the engagement and customer acquisition gains achievable;” commented Peter Gowrie-Smith, Managing Director of the Magnetise Group. Magnetise’s growth has been supported by its strategy of integrating third party innovations for clients as soon as they become relevant. Google’s ‘Get Offers’ and Twitter’s Lead Generation Cards for example are both helping clients innovate and reach new audiences at the same time as growing their campaign budgets. Integrated into the Lead Intelligence management and analytics platform, major advertisers and large publishers can now quickly and easily add these exciting new engagement opportunities to their lead generation programmes. From inception, Magnetise has also developed proprietary technology solutions to drive lead generation opportunities through all popular media channels. Its AdCentre premium network powers multi-format, multi-channel lead generation through media including mobile, email and content, as well as the stand-out In-Banner display solution which enables lead generation to engage high value demographics out of reach of the usual performance media channels. The In-Video solution does similar through the increasingly mainstream online video channel while Magnetise’s TopFox white label competition platform draws leads from editorial and community media. Magnetise technology in tandem allows clients to go far beyond the initial lead generation phase, nurturing prospects through the conversion funnel, registering and logging in users and delivering the end-goal of customer generation within the same campaign flow. “Spend on lead generation is nearly $2 billion a year already in the US and the UK and Europe are still fast-growing markets. We’re confident that our relative maturity in the marketplace, continued innovation and clear business purpose will move Magnetise further up the global Deloitte Technology Fast 50 leaderboard at the same time as increasing the success of both Magnetise and its client base;” added Peter Gowrie-Smith.